Disclosure: All the electronic cigarettes which we review on this website are tested by our trained, paid staff. As part of the review, VapingDaily.com links directly to the product or brands so that you may purchase directly from the provider. We receive commissions from these providers, however, this does not affect the price you pay, and the commissions we earn help us pay for the costs of running this website. Click here to learn more. Thank you. Our Verdict: One of many companies that offer disposable cig-a-likes, Cigirex tries to distinguish itself with its low price while marketing its products as looking and feeling like real cigarettes. Advanced vapers may not find something for themselves here, but new users might. 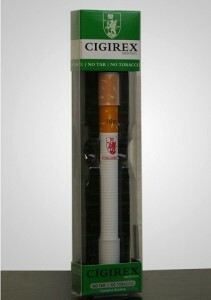 Packed in a sturdy plastic box, the Cigirex Disposable may be affordable but its packaging shows it is not cheap. The device itself is typical of disposable cig-a-likes, with dimensions and aesthetics mimicking that of traditional cigarettes. The company claims that each disposable is good for about 500 puffs, or equivalent to 42 cigarettes. Ingredients listed are water, vegetable glycerin, and flavoring. The use of VG is a good choice since some people may be allergic to PG. Nicotine strength can be chosen by customers with levels that vary from 0 nicotine to 18mg. The lack of 24mg or 36mg may be a problem for new users, especially those who are heavy smokers. 18mg may be good enough for the majority of ex-smokers, but some may find its strength lacking. The Cigirex Disposables come in menthol and regular flavors. “Regular” being tobacco based. For female users, there is also the “slim” variant, which is sleeker than the regular disposable designed to mimic slim cigarettes that many women prefer. Despite the slim designation, it still lasts about 500 puffs or an equivalent of two packs. Compared to other disposable cig-a-likes, the Cigirex versions do feel more like actual cigarettes due to its softer and more malleable tubing. The end of the device lights up red, as opposed to the traditional blue of other brands, which more resembles a real cigarette. The menthol flavors are decent, though not exceptional. However, it does taste better than other brands’ menthol flavors. The regular variant however is flat and tastes far from authentic. Vapor production is decent, but not overly impressive. The Cigirex Starter Kit is the rechargeable version of the company’s disposable devices. The look and feel of these are similar to the disposable. However, users can replace the cartridge when the flavor is exhausted, and can recharge the battery when it goes out. The Starter Kit comes in a container that looks a lot like regular flip top boxes. Two cartridges are included, which combined is equivalent to 70 cigarettes. When the included cartridges run out, users can purchase refill packs of five cartridges each at $19.95. However, for “light” (11mg nicotine) and “zero” (0mg nicotine), refills cost $29.95 for five cartridges. Why the difference in price is unknown, but this can be a deal-breaker for many users. Battery life for each recharge is rated by the company as good for four hours. However, users report that their devices last just a little over three hours. Of course, battery runtimes depend on how one vapes. One who takes longer puffs can expect lower battery life as opposed to one who takes quick draws. As with the disposables, nicotine levels range from 0mg to 18mg, and flavors are limited to regular and menthol. Both flavors are not anything special, and vapor production is nothing to write home about. For users who are looking for the most authentic feel with their disposable or rechargeable cig-a-likes, Cigirex comes close. It is perhaps what makes the company’s products unique. However, the vapor production is far from excellent, and flavors are a hit and miss. Battery life for the rechargeables falls short of expectations though this can depend on how one vapes so your mileage may vary. Pricing is very competitive, though, and it is worth a try. However, the variety of its products is very limited and flavors available are stuck at two. If you are a new vaper looking for an e-cig that feels like traditional cigarettes, Cigirex may be your best bet. It is affordable enough to give it a shot, at least.